The Bernina 880E Plus is currently only available for special order, please allow 6 weeks for delivery. The most space. The most speed. The most precision. The Bernina 880 boasts many cutting-edge features developed by a team of experts in Switzerland. It has state-of-the-art technology combined with Swiss craftsmanship. The unprecedented functions and innovative features are designed with the sewer, quilter and embroiderer in mind. Imagine a machine that automatically responds to your needs. The presser foot automatically lowers at the start of a seam and lifts again at the end. The Bernina 880 will even cut the thread for you at the end of a seam or colour change in embroidery. The feed dog raises and lowers automatically for free-motion stitching and embroidery, and of course, fully automatic threading is yours at the touch of a button. With a top speed of over 1000 sewing stitches per minute the Bernina 880 still hums and produces flawless stitches and georgeous designs. The 7" touchscreen on the Bernina 880 offers high-resolution images and brilliant colours. Cutting-edge touchscreen technology lets you choose from a wealth of innovative functions. The BERNINA 880 offers drag and drop, vertical scrolling and the swipe function for deleting motifs easily. It also features a highly intuitive onscreen operating concept providing numerous personalized settings. Our exclusive multi-spool holder keeps large, medium and small cones at the ready. The vertical holders and telescoping feature make for the smoothest thread release possible. In addition, the bobbin winder is located on the front of the machine for easy access, and it lets you select speed and amount of fill. Exclusive features, such as the BERNINA Stitch Regulator, give you the ultimate in creative control. This revolutionary presser foot makes free-motion sewing easy and fun. Your stitches are beautifully consistent, whether you sew fast or slow. And only the BERNINA 880 offers 360-degree-multi-directional sewing on all 9mm stitches. Plus, you can infinitely adjust length and width on all your stitches. But that's just for starters. Our quick-reverse feature lets you step back into the exact same holes, so that new holes are not created going backward and forward. And our Altered Stitch Memory lets you remember your altered stitches when you turn off your machine or if the power goes off. 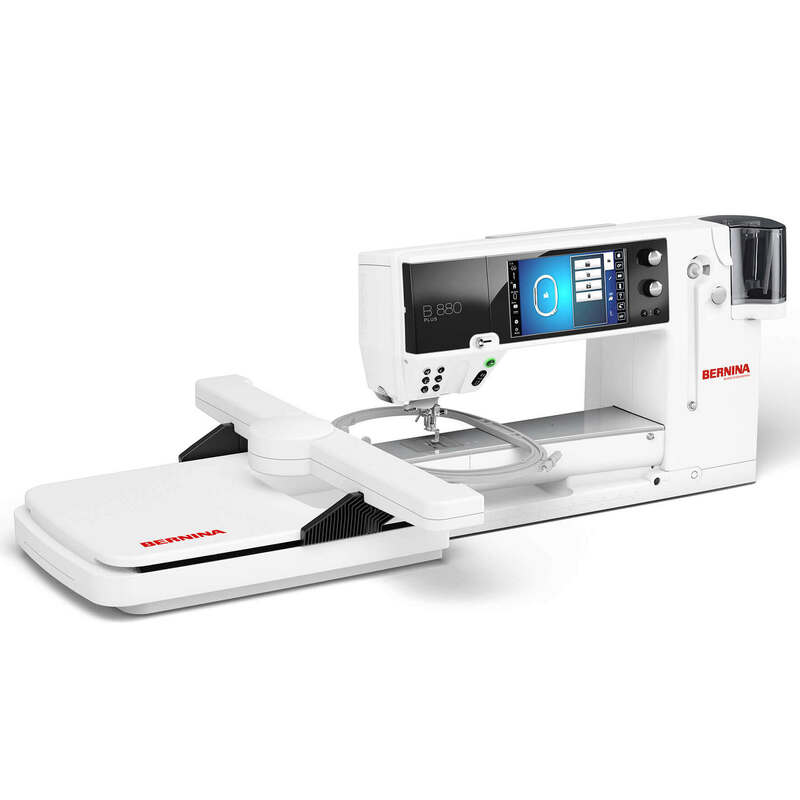 The Bernina 880 includes a library of over 1,764 stitches, conveniently stored by category for a wide variety of applications. You'll find the perfect stitch for every sewing project. With the innovative Stitch Designer you can edit these or create your own stitches. Simply draw your ideas directly on the screen. The Bernina 880 converts the design with a click into a stitch pattern. You can also change and save existing stitches. The possibilities are endless and your stitch library is continually expanding. With 400 built-in designs and alphabets, embroidery is just a click away. Also, your own motifs can be quickly loaded onto the machine via two USB ports. With the the Colour Wheel, designs can be changed easily and coordinated to your favorite colour scheme before you start embroidering. This makes it easy to choose the most beautiful colours for your embroidery project. Mirror image, rotate, combine and resize designs right on the colour touch screen. Built-in basting boxes hold difficult to hoop items in place for embroidery. Create arched lettering effects, adjust design density and even bring decorative stitches into embroidery. Automatically colour sort complex combinations, preview alternate colour options on screen with the help of the Colour Wheel, and save to your machine or a USB stick. Wish to stitch out border designs? The Endless Embroidery function will walk you right through the process. Finally, you’ll love Absolute Check for perfect design placement. The optional Jumbo Hoop offers a range of advantages for embroidery projects be they easy or challenging. With a maximum embroidery area of 40cm x 26cm (15 ¾" x scant 10 ¼"), this BERNINA hoop is ideal for large scale embroidery designs and design combinations. Borders are also a pleasure to embroider with this extra large hoop. The Jumbo Hoop boasts an ergonomic mechanism that greatly simplifies the hooping and unhooping fabrics and is deep enough to take a quilt sanwich for Hooped Quilting. Will cover Seven years parts and labour providing that your machine is serviced every three years by a Bernina Specialist Dealer. At Frank Nutt Sewing Machines we have an in house servicing and repairs team that are on hand to help. Please see our Machine Repairs page for more details or get in touch on 0121 443 5555 / info@franknutt.co.uk. We can answer any queries and talk you through the servicing and repairs process. This product will take up to 28 days for delivery due to it being the made to order.